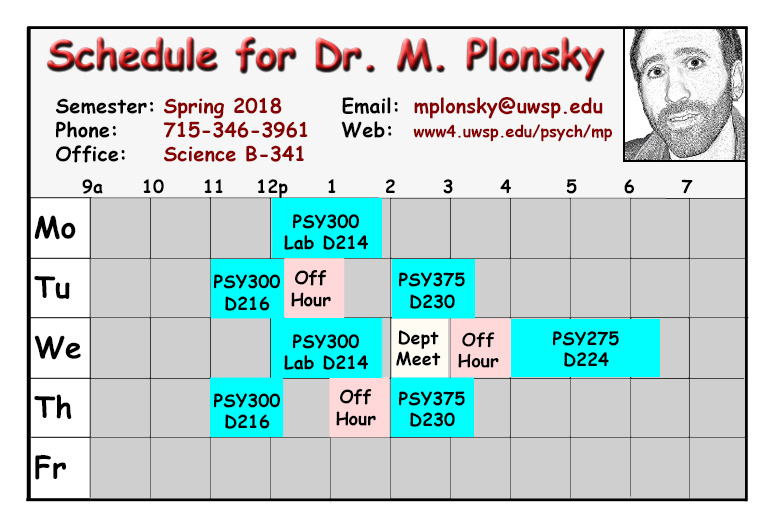 Dr. M. Plonsky - Spring, 2018 (Last update 1/10/18). Class meets Wednesdays from 4:00-6:30 p.m. in Sci-D224. Please bookmark this page, print it, & use it as a reference throughout the semester. While it may be modified, you will be notified if it is through announcements in class and/or email. Course Description - goals, readings, attendance (& notes), grading, expectations, additional issues, contact info. Grade Postings (Grading Code Collection Form - please fill out during the first week of class). From the catalog course description, the course will deal with the "evolution, history, sensory abilities, social behavior, learning and methods of dog training. Behavior problems and ways dogs work with and help people." Thus, the goal of the course will be to gain an understanding of canine behavior with the primary emphasis on dogs. The scientific perspective will be stressed, since it is how I was trained. However, I also have a great deal of respect for folks working in the field, that is, trainers who most often have little knowledge of science. We will employ multimedia lectures, discussion, videos, & demonstrations. Compare and contrast different perspectives employed in studying and understanding canine behavior. Explain how evolution is relevant to understanding dogs. Or, in other words, differentiate between theories regarding how the dog was transformed from a predatory wolf to our “best friend”. Identify and describe different ways in which canines can be trained. There are two required books that are available in the college bookstore listed below. In addition, I have provided some articles that I have written that are pointed to in the tentative schedule below. Finally, I may also provide a few relevant articles over the semester via email. Lindsay, S. R. (2000). 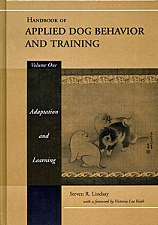 Handbook of Applied Dog Behavior and Training. Volume 1: Adaptation and Learning. IA: Iowa State University Press. McConnell, P. B. (2003). 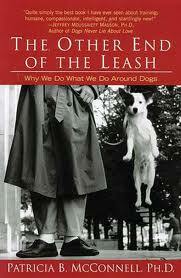 The Other End of the Leash: Why We Do What We Do Around Dogs (Paperback). NY: Ballintine Books. According to the university Attendance Policy, you are to "Attend all your classes regularly". While I do not formally take attendance, it is unlikely that you will do well in the course if your attendance is poor. There are at least two reasons for this. The first is due to the fact that the exams include some material only presented during class sessions. Second, I believe that in class discussion of the material is necessary to gain the level of understanding of the material required. If you miss a class, it will be to your benefit to find out what occurred during that class from a classmate. Most of the text for multimedia slides used in lecture are available below in a format that can be read by most word processors. I recommend printing these (in whatever manner you find most useful) and bringing them to class prior to the coverage of the material. with the text of the lectures provided above comprises the study guide for the class. Four exams will be given. Each will consist of 50 multiple choice questions. Each question will consist of from 3-5 choices. No questions will contain a choice such as, "all of the above", "none of the above", or "two of the above", etc. Each exam will mainly cover material since the previous exam. I use the word "mainly" because the material on a specific exam may depend on understanding something covered earlier in the course, in which case the earlier material is fair game as well. Furthermore, there are often themes/perspectives in the course that repeat throughout the semester that may be tested on. One test score that is significantly lower than the other three. You will be responsible for both the assigned readings and the lecture material. Many students dislike the reading. Nevertheless, I must prepare you to learn independently. Reading is a necessary skill in this regard. I will post exam scores on the web a couple of days after each of the exams for students who give me a code to do so as well as provide you with a conservative estimate of your overall performance in the course after each exam. By the way, until I post the grades for the first exam, you will be able to see the grades I gave the last time I taught this course at the grade posting link. Bring a couple of Number 2 pencils for the exams. If you are wearing a hat with a brim, I will ask you to turn it around or take it off when taking exams. Music players (e.g., ipods, cellphones) are not allowed during exams. Cheating on an exam will lead to an automatic failure of that exam and possibly other penalties. For more details see the document entitled, "Student Academic Standards and Disciplinary Procedures" (a PDF file). For a simple and less technical read, try this document on Academic Integrity. Failure to show up for an exam results in failure of that exam. If you must miss an exam, let me know BEFORE the exam takes place or written documentation of the emergency will be required. Furthermore, if you miss more than one exam written documentation is required. If you wish to reschedule an exam, send me an email no more than one week prior to the occurrence of the exam. I will then send you an email with the times that the psychology department has available for make-up exams (typically there are 3 times available each week). Your reply to my email with your choice of a date & time will then serve as my reminder to give the proctor your exam. You are allowed to reschedule an exam in this manner one time in a given semester before written documentation is required. Note that if your cumulative grade in the class is less than a 'B-', I do not recommend postponing an exam. Lastly, a makeup exam must be taken within 2 weeks of the original exam date. Testing accommodations for students with disabilities are coordinated through the Disability and Assistive Technology Center on campus. Please be sure to take care of these arrangements well ahead of time. Concerning withdrawing from a class, it must be done in a timely manner in accordance with UWSP's published deadlines. Failure to do so could result in a failing grade or the loss of reimbursable tuition fees. To agree to study this syllabus carefully (ASAP) & refer to it when questions arise about the class. To acknowledge that effort, by itself, is not enough to justify a worthy grade. In other words, you are graded primarily on the merit of your performance in the class rather than the amount of effort you put into the class. To acknowledge that previous academic preparation (e.g., biology, math, etc.) matters. Those who are better prepared are likely to do better in the class. To attend class & give your full attention to the material, as well as conduct yourself in an appropriate manner (e.g., not having personal conversations during lectures or performing other activities that disrupt the class). As noted earlier, I believe class discussion to be a necessary ingredient for the class to accomplish its goals. Thus, if class participation is not forthcoming, I will call on people at random. To meet the obligations of the course (e.g., reading, assignments, etc.) and not make excuses for your failure to do so. To treat everyone in class, including the professor, with respect. To check your university email account several times each week. I will make announcements via this medium. To not plagiarize or otherwise steal the work of others. To understand & adhere to your Rights & Responsibilities as a UWSP student. To turn off or silence cell phones when in class. To manage the class in a professional manner. This may include educating you in appropriate classroom behavior. While I am quite tolerant of inattentiveness, I am not at all tolerant of disruptive behaviors. To prepare carefully for each class & begin & end it on time. To try to learn your name (if class size permits) & to recognize your individuality & treat you with respect, as well as to be honest with you. I apologize in advance for being bad with remembering names. To treat all students equally. Thus, I will not discriminate on the basis of your identity, appearance, gender, race, creed, color, viewpoints, disability, whether I like you or not, or anything else. To have 3 office hours each week during which you are welcome to stop by (no appointment necessary). See contact info for more detail. To give grades primarily based on the quality of your work. To be honest about what I know. If I do not know something, I will say so (and then I will probably look it up). To treat any plagiarism, cheating, or other violations of academic integrity harshly. To silence my cell phone when in class. Audio recording of what goes on in class is permitted only with my explicit permission. I do not permit any video recording, however, you can take pictures of slides I present to the class. You may not distribute any audio recordings or images of slides. In other words, what is presented in this classroom should not be presented anywhere else. Keep in mind that if these rules are broken, there can be legal consequences. International students are admitted to UWSP with the understanding and documentation that they have the English-language proficiency necessary to be successful in our courses. Since I realize that language can still be an issue, I will permit hard copy dictionary use during exams for these students. Note however, that use of electronic translation devices will not be permitted. In the event of a Medical Emergency, call 911 or use one of the red emergency phones located around the campus. Offer assistance if trained and willing to do so. Guide emergency responders to the victim. In the event of a Tornado Warning, proceed to the basement of the building. Avoid wide-span rooms. In the event of a Fire Alarm, evacuate the building in a calm manner. In the event of an Active Shooter, "Run/Escape, Hide, Fight." If trapped hide, lock doors, turn off lights, spread out and remain quiet. Call 911 when it is safe to do so. Follow instructions of emergency responders. See UWSP Risk Management Website for additional details. Due to Title IX legislation (federal law), if any disclosure of unreported neglect or abuse of a child, elder, or disabled individual is made to a University instructor, he or she is required to report such information to the appropriate administrative or law enforcement officials. This includes instances of sexual harassment/assault of an adult, bias and hate crimes, etc. My office is located in Science B-341. I will have office hours Tuesdays from 12:15-1:15 p.m., Wednesdays from 3-4:00 p.m., and Thursdays from 1-2:00 p.m. (or you can arrange to see me by appointment at some other mutually convenient time). Note that my office hours do NOT require an appointment. If my door is closed, please knock. You can see a visual of my schedule here. You can reach me at 346-3961 (and please leave a message if I am not available) or through electronic mail at mplonsky@uwsp.edu. Do not hesitate to contact me if you have any questions. When sending me an email, please following the directions below carefully. It will ensure a more timely and relevant response from me. I typically reply within 1-2 business days. Use the “Subject:” line. It should summarize the point of the email in a couple of words. Tell me which class is involved. I typically teach 3 classes & have about 100-250 students each semester. Write professionally. In other words, use whole words and sentences, unlike texting where you might use the minimal amount of letters you can get away with. A worthy website regarding this issue is Netiquette by C. Pirillo. Barring illness on my part or other such unforeseen emergencies, we will stick with this schedule. If changes are necessary they will be announced in class and via email. 3/14 Breeds p. 23-30, 187-188, 193-195. NOTE: The exam is only 1 hour, rather than from 12:30-2:30 p.m. as indicated in the timetable.